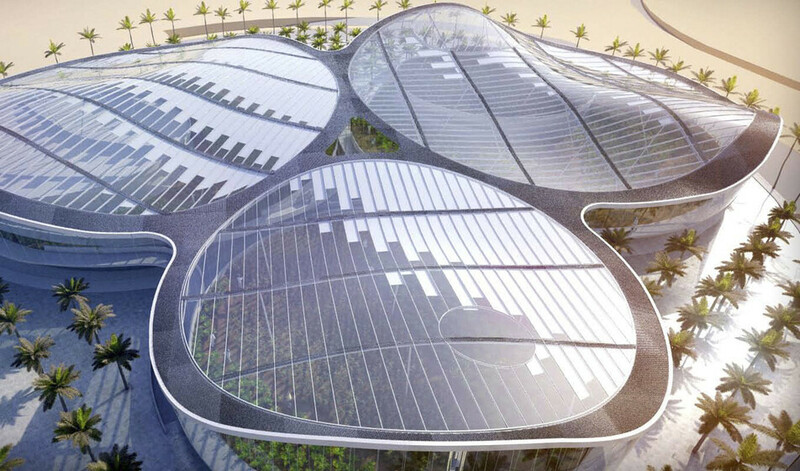 The ‘Iconic Greenhouse’ is a collection of biomes that mimic the growing conditions of a Mediterranean and Tropical climate. 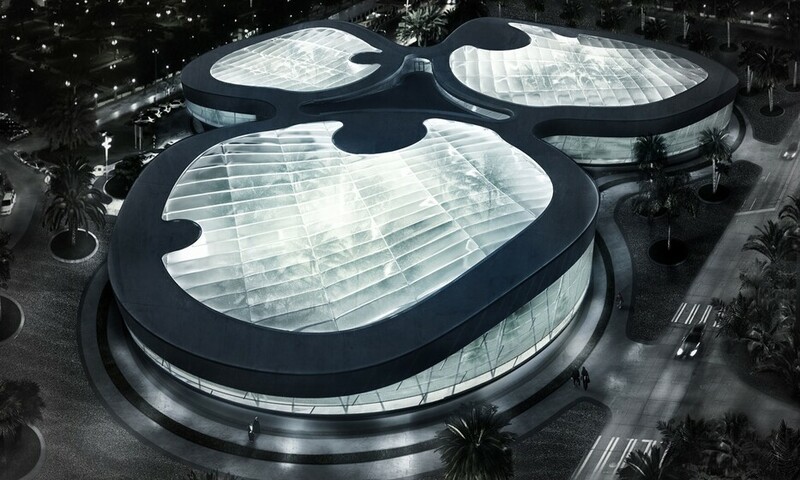 The complex, for a private client, will deliver produce for visiting guests within the Emirate of Abu Dhabi. The complex is made up of three biomes on different levels connected via a common central core. 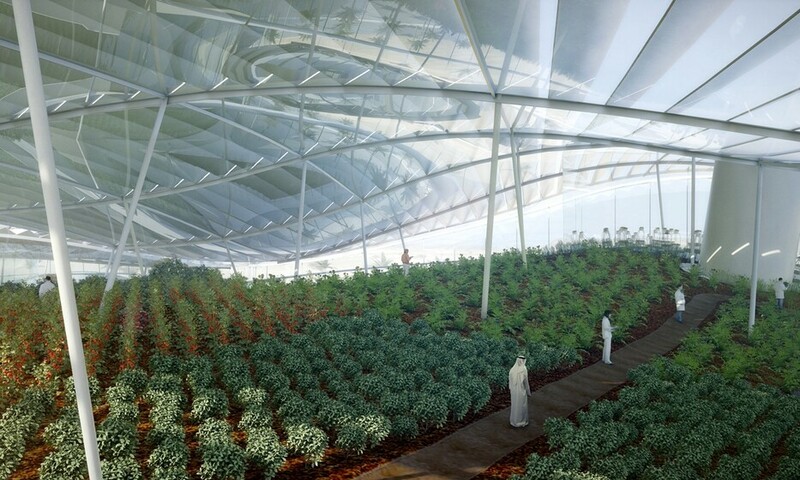 Each biome is approximately 3300m² constructed from reinforced concrete with an ETFE wall and roof structure providing a lightweight frame to accommodate the significant soil required for the planting beds. Each biome represents a different climate: namely, a Mediterranean climate, a Tropical environment and a Vernalized space for the propagation and flowering of fruit not indigenous to the area. A stable growing environment is required and the challenge is to mimic the conditions encountered in these regions, controlling both day and night temperatures for each season. The ventilation system serving these areas is key and as such, we have designed a minimum fresh air system distributed via ventilation towers fed from an undercroft beneath the planting beds. The air is delivered at higher velocity than normal to stimulate plant growth and exercise the plant structure. Within the Tropical biome, installed water features include planting ponds and a waterfall together with a ‘misting system’. A water harvesting system will maintain the balance within the pond areas. The Vernalized biome, used for the propagation of the fruit trees, has very specific environmental conditional requirements. The plants and trees need controlled ‘chilled’ hours to flower: to achieve ultra-low temperatures of 7°C for an average of 900 hours per single period and is not simple in the Middle East. As a result, we have utilised a dedicated chiller delivering chilled water at -2°C and located within the remote energy plant centre. 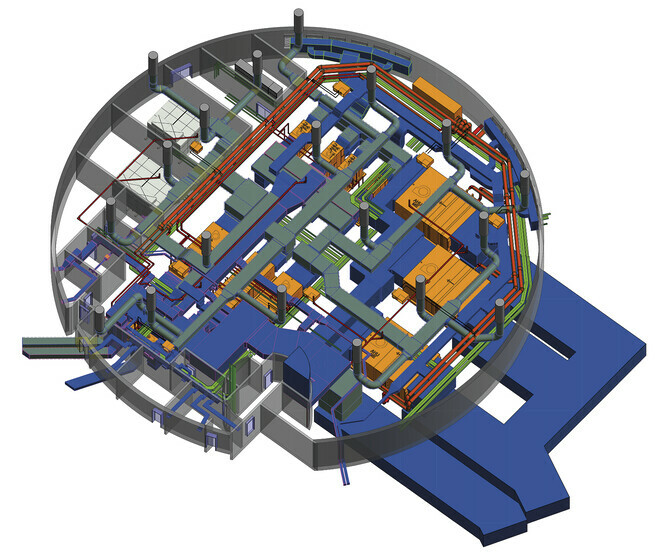 Overall the site will use 5Mw of cooling and 1Mw of power to maintain the site parameters. To aid in reducing peak temperatures, the ETFE has an internal shading element to help reduce heat gains during the summer and also to control the amount of daylight entering the space. The artificial lighting is controlled via a Lutron EA Lighting control system which optimises the lighting hours. This also covers the central spaces and the external perimeter of the building.